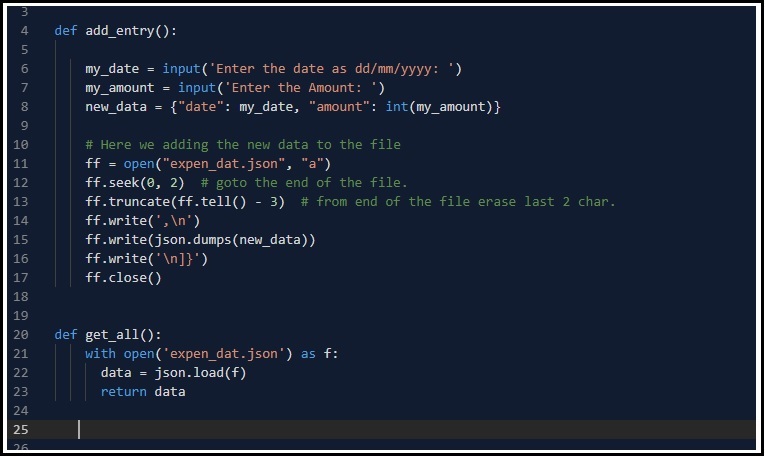 Convert the Negative to JPG Files..
Sun Eclipse Lens cover … Create One..
Fruit Macro, Fig Session ..
We will call the function def add_entry(): and will give the user the prompt to enter “Date” and “Amount” then we will write them to our json file. Just to be as less codes as we can, I am not adding any validations here also not coding the try .. except. So I am assuming the entered data will be in correct way. ff.seek(0, 2) # goto the end of the file. ff.truncate(ff.tell() – 3) # from end of the file erase last 3 char. If you add the “User input choice” in your code this function will be on choice “1” as here. Table of posts regarding the Expenditure App.. Here is the code shot.. Here is the output screen.. Taking pictures is not my main daily practices, but when i start playing with my camera, i really enjoy my self. Thanks for visiting my Space.. I start using the Flag Counter after one month of publishing on Wordprees and after 678 visitors.